I love bubble baths. I always have. I don’t like baths for the purpose of getting clean. I like them as a means of relaxation. For me it’s a moment away from my kids, my daily stresses, the dirty dishes, spongebob…I could go on and on about the things I like to escape from. 3. Mommy, why are you naked in there? 4. Mommy, can I have a gummy worm for dinner? Today was no different. This morning I woke up feeling achy from any number of things that are going on in my life so when the baby went down for her morning nap I thought I might sneak in one of these relaxing baths. I bribed the 10-year-old to watch the toddler so I wouldn’t be interrupted. But I was not so lucky. Within minutes I had been given figurines from Jake and the Neverland Pirates, 2 floaties and was given very specific instructions on how they needed to stand. 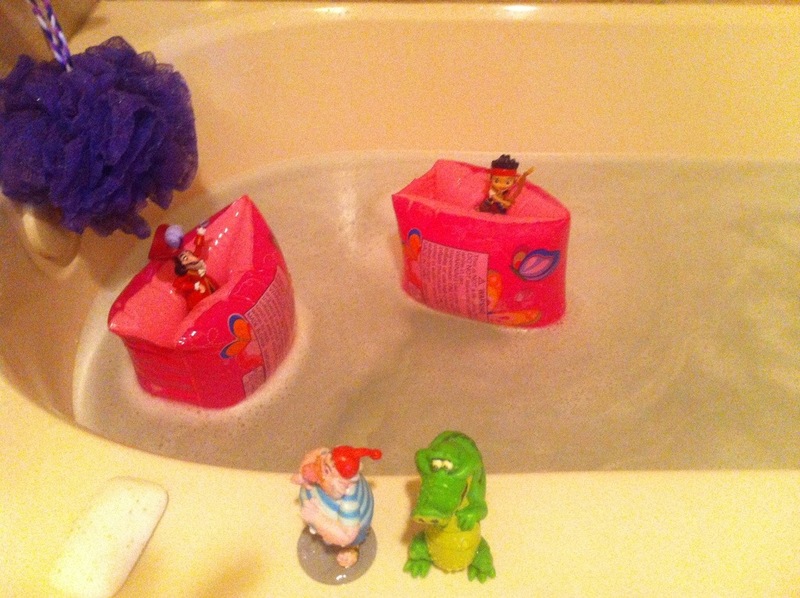 She just wanted me to have company I guess so there I soaked along with Jake & Captain Hook. I didn’t mind so much. At least I didn’t get lonely.